As a user, I should see "Native" as the first toggleable option for AMPhtml so that I am most likely to choose this option. AC1: Instead of the ordering list of "Classic, Paired, Native" I should see "Native, Paired, Classic" as the three options. Currently the operational mode of the plugin can be configured in the admin via toggle buttons. The current ordering of the buttons reflects the chronological evolution of the modes: Classic, Paired, Native. Proposal: Change the order to have Native first to implicitly encourage that as the best option. Hi @amedina, Thanks for this! I've wrote a quick user story for this ticket. We should be able to add this to our v1.0 stable release. Confirmed, Moving To "Ready For Merging"
This look good. 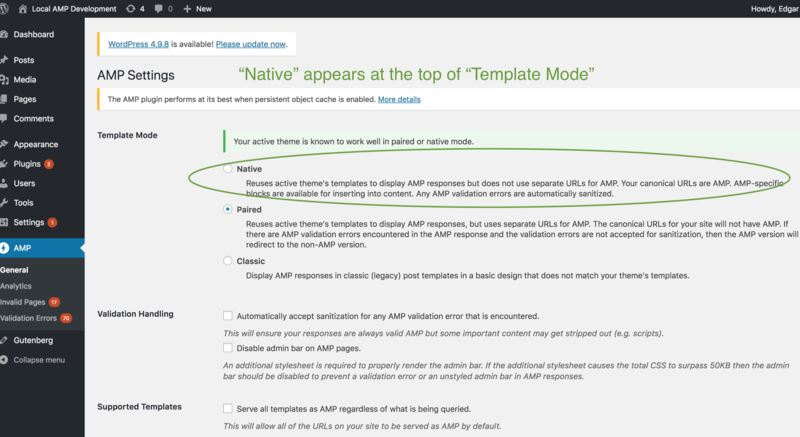 "Native" now appears at the top of the "Template Mode" field. I'm moving this to "Ready For Merging."